Hong Kong: Out of the darkness appeared a snout. “Fei zhu! 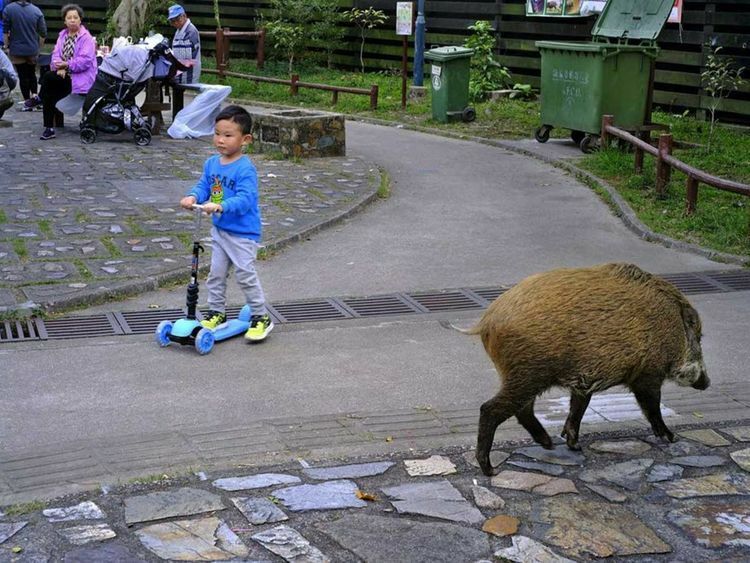 Fat pig!” eight-year-old Shino Chen shouted to her younger brother as she jumped up and down and pointed at a wild boar. The hairy black pig, which must have weighed at least 68kg, grunted and snuffled through a flimsy, old fence along the sidewalk. The children tiptoed toward the animal then sprinted back to their father’s side. Kenneth Chen, 44, and his children visit the boars almost every night. All they have to do is step out of their apartment here in the neighbourhood of Tai Wai, located on the fringes of an ever-expanding metropolis. Hong Kong’s 7.4 million residents spend most of their days rushing between high-rises, metro stations, tiny apartments and air-conditioned offices. People occupy less than a quarter of the 1,103-square-kilometre region, making its urban core one of the most densely populated places in the world. There have also been injuries: A 70-year-old man was hospitalised last week after he threw a stone at a wild boar and the animal retaliated by biting him. The classic solution for boar overpopulation in most places is hunting. Hong Kong once licensed hunters to kill boars, especially in rural areas where farmers often complained about the animals uprooting their crops. Boars have also provoked anger for lurking around cemeteries, waiting to eat food that people leave on graves to honour deceased relatives in accordance with Chinese tradition. “It is very cruel, not civilised behaviour to do that,” Wong explained. But wild boars are strong swimmers, and their predators — tigers and wolves, among other carnivores — wouldn’t exactly fit the urban landscape either. A team of veterinarians recently launched a two-year pilot sterilisation programme that starts with tracking down boars and shooting them with tranquiliser darts. “Sometimes it’s in the middle of the city centre, like a big pig in a small area and it’s very challenging,” said Karthi Martelli, one of the vets. “It was really cute once upon a time, but I mean, wild pigs running loose in a city centre is not very exciting anymore,” Martelli said.